Two foreign nationals, including one who was reportedly in the U.S. illegally, are accused of beheading a 13-year-old girl in Alabama after she witnessed her grandmother being stabbed to death in a drug deal gone wrong. According to authorities in Huntsville, Ala., Israel Palomino, 34, and Yoni Aguilar, 26, have each been charged with two counts of capital murder after allegedly killing 49-year-old Oralia Mendoza along with her 13-year-old special needs granddaughter, Mariah Lopez. 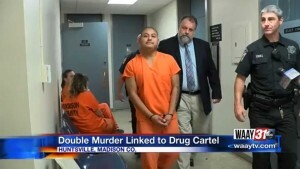 Investigators said Mendoza was involved with the Mexico-based Sinaloa Cartel, a prominent international drug trafficking organization. She and three others reportedly “went to pick up a batch of methamphetamine” on June 2, investigators said. But something went wrong that made Aguilar and Palomino suspicious that Mendoza may have been setting them up. Two days later, on June 4, the pair drove Medoza and her granddaughter to a nearby cemetery, where they stabbed the woman and left her to die. Concerned that 13-year-old Mariah had witnessed the murder, the pair them reportedly took the young teen to an isolated area and beheaded her with a knife. Her decapitated body was found three days later by a farm worker and identified by her mother. Medical examiners confirmed the girl had a cerebral shunt, a device most commonly used to treat hydrocephalus. Immigration officials confirmed Palomino has been placed under an active ICE detainer, the Atlanta Journal-Constitution reports. Aguilar is reportedly in the United States under a green card. Both men are being held in custody.